Arab League Secretary-General Ahmed Aboul Gheit speaks during Arab League foreign ministers emergency meeting on Trump's decision to recognise Jerusalem as the capital of Israel, in Cairo, Dec. 9, 2017. The statement was issued early Sunday after an emergency meeting of league foreign ministers in Cairo and went on to say that Trump’s decision also strips the U.S. of its role as a “sponsor and broker” in the Mideast peace process. 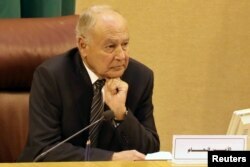 Arab League Secretary-General Ahmed Aboul Gheit attends the Arab League foreign ministers emergency meeting on US President Donald Trump's decision to recognize Jerusalem as the capital of Israel, in Cairo, Egypt, Dec. 9, 2017. The head of the Arab League called on the nations of the world to recognize Palestine as a sovereign state with Jerusalem as its capital, in response to Trump’s announcement. The ministers also called on the U.N. Security Council to adopt a resolution condemning Trump’s decision. The meeting in Cairo took place after three days of street protests in the West Bank and Gaza Strip, as well as protests at Al-Azhar Mosque in the Egyptian capital. Palestinian National Authority Minister of Foreign Affairs Riyad al-Maliki attends the Arab League foreign ministers emergency meeting on US President Donald Trump's decision to recognize Jerusalem as the capital of Israel, in Cairo, Egypt, Dec. 9, 2017. A report in “Foreign Policy” magazine says the White House, in a recent meeting with Palestinian diplomats, failed to tell them about Trump’s Jerusalem decision even as the delegation asked if Trump would sign the waiver to prevent the U.S. Embassy from moving to Jerusalem. The heads of the largest Christian church in Cairo and Al-Azhar University have said they will not meet with U.S. Vice President Mike Pence when he visits Cairo on December 20. Palestinian President Mahmoud Abbas has also announced he will not meet with Pence, saying “the U.S. has crossed red lines” on Jerusalem. 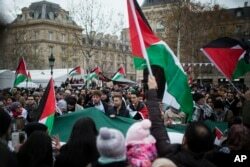 Demonstrators shout as they hold Palestinian flags during a protest against U.S. President Donald Trump's decision to recognize Jerusalem as Israel's capital, at Republique Square in Paris, France, Dec. 9, 2017. Pro-Palestinian rallies also took place Saturday outside the U.S. Embassy in Rome. Demonstrations took place Friday in Iraq, Jordan, Syria, Pakistan, Lebanon, Malaysia and Indonesia, the world’s most populous Muslim-majority country. Earlier Saturday, Israeli airstrikes killed two men in the Gaza Strip. Hamas said it lost two gunmen in those airstrikes. Some of the United States’ oldest allies turned their backs on Washington’s decision to recognize Jerusalem as Israel’s capital during an emergency meeting of the U.N. Security Council on Friday. 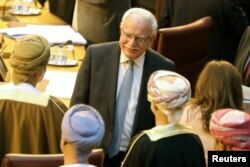 More than half the council’s 15 members requested the open meeting, and delegations from other U.N. member states packed the chamber, indicating the importance Jerusalem’s status holds around the globe. 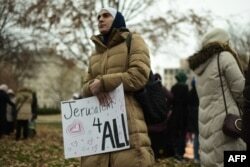 FILE - A woman carries a poster reading "Jerusalem for All" as Muslim worshippers gathered in front of the White House for Friday prayers in Washington to protest President Donald Trump's declaration of Jerusalem as Israel's capital, Dec. 8, 2017. Security Council members criticized the Trump administration decision, saying it risked prejudging the outcome of final status issues and threatened the peace process. They also expressed concerns it could be exploited by extremists and radicals, fueling tensions in an already turbulent region. Trump’s announcement defied decades of diplomacy in the quest to bring peace to Israel. Jerusalem has been one of the biggest stumbling blocks in the quest, and it was widely believed that a solution would be found in peace negotiations. The White House has denied that the president’s announcement on moving the U.S. Embassy to Jerusalem means his administration is pulling out of the Middle East peace process. No other country has immediately followed Trump’s lead in planning to relocate its embassy from Tel Aviv to Jerusalem, something the White House has acknowledged.